Width 29.5", 41.5", 47.5", 59.5", and 71.5"
Does the Modesty Panel with Wire Management provide enough organization to replace the Advanced Wire Management Kit? The mesh sleeve on the UPLIFT Desk Modesty Panel with Wire Management is a great way to conceal wires. However, if you want total under desk cable organization there is no substitute for the Advanced Wire Management Kit, or for the best of both worlds, the Ultimate Wire Management Kit which swaps the wire management tray in the Advanced Wire Management Kit for a 29" modesty panel that fits right between the grommets on UPLIFT desks. The Modesty Panel with Wire Management will attach to your desk with two or three brackets, depending on the size of the panel. The brackets attach with regular wood screws. Just double-check that the screws are not longer than your desk is thick before you drill into the desktop. What is the purpose of the modesty panel? The Modesty Panel with Wire Management has two functions: it conceals your legs from view if your desk faces into a room, and it also provides a mesh sleeve to organize wires. How does the modesty panel provide wire management? The Modesty Panel with Wire Management has a mesh sleeve to hold and organize your wires. Depending on the length of the panel, there will be two or three holes where the brackets attach to your desk. Route your cables through the holes and bundle them in the mesh pocket. 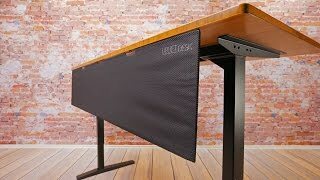 Will the Modesty Panel with Wire Management interfere with the clamp-on UPLIFT Monitor Arm? You can definitely install both on your UPLIFT Desk. We recommend installing the Modesty Panel with Wire Management a few inches inward from the back of your desk to leave enough room for the monitor arm clamp. Is the Modesty Panel with Wire Management see through? The Modesty Panel with Wire Management is meant to provide privacy and is not see through. The Modesty Panel with Wire Management comes in preset sizes to fit most UPLIFT desk models. Choose from 29.5", 41.5", 47.5", 59.5", and 71.5" wide panels to outfit your workstation for better privacy. Partial modesty panels are 41.5 inches wide and feature partial under-desk coverage and wire management for sit-stand workstations. 29.5" modesty panels fit on both the right and left side of your desk. Compatible Desk Widths 42", 48", 60", 72"